A couple of weeks ago I had one of those inspired moments in the grocery store where I decided to buy some winter squash. After all, we haven’t had a winter quite like this one in New York in many years, so it felt especially appropriate. The only problem with these on a whim purchases is that I usually don’t have a recipe in mind so have to get creative when it comes to using the ingredient. It also means, that throughout the weeks, my ingredient gets more and more lonely in the fridge as the rest of the groceries get used. 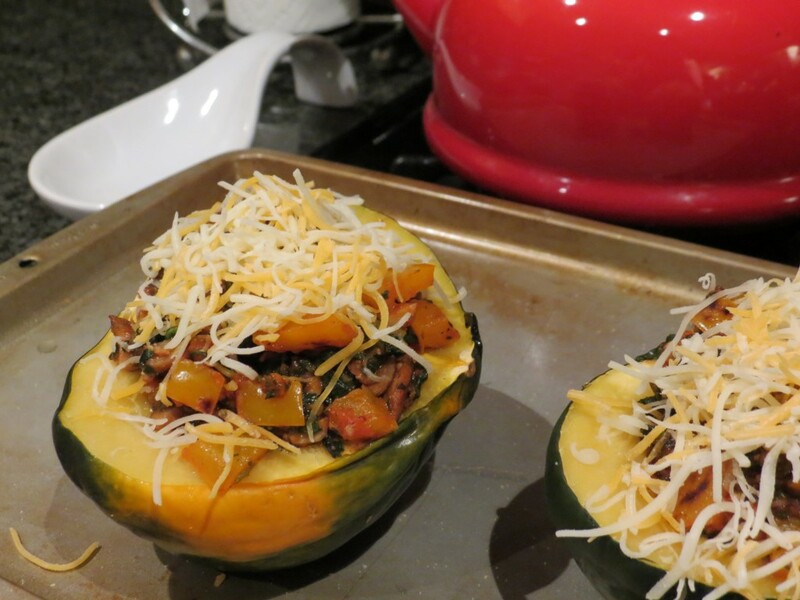 Last night, after a trip to the gym I needed a healthy, quick, and comforting dinner and the acorn squash was calling out my name. The first step is to prepare the squash. This is pretty simple. With a large chef’s knife, turn your squash upside down so the stem is on your cutting board and slice vertically (from the bottom point of the squash through the stem at the top). 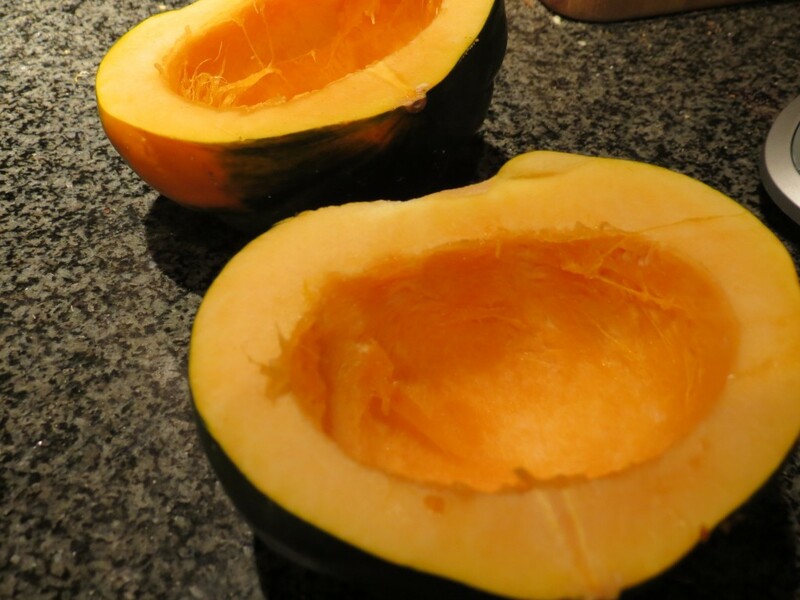 Be sure you have a very sharp knife so you can make it all the way through the squash. Next, using a soup spoon, scrape out the seeds and membrane. You can roast these seeds with some cumin and salt if you want a tasty treat or to add some crunch to the dish. I discarded them. As I mentioned, I needed a quick meal, so I decided to start the squash in the microwave. I knew I wanted to finish it in the oven, so I preheated it to 425*F. To cook the squash in the microwave, place the cut sides down on a piece of plastic wrap and cook for 8 minutes. While that’s cooking, you can prepare the filling. 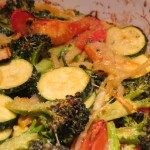 Heat up 1 Tbsp olive oil in your pan. I used a mushroom olive oil, but it’s not necessary. 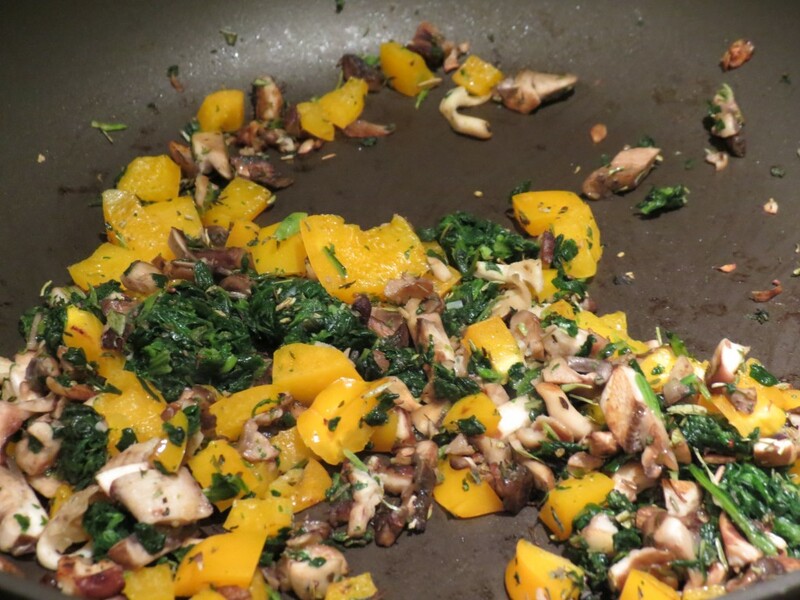 Rough chop your mushrooms and add them to the pan along with the garlic salt and herbs de provence. Cook for 3-5 minutes until browned. Next, cube and add your bell pepper and spinach. 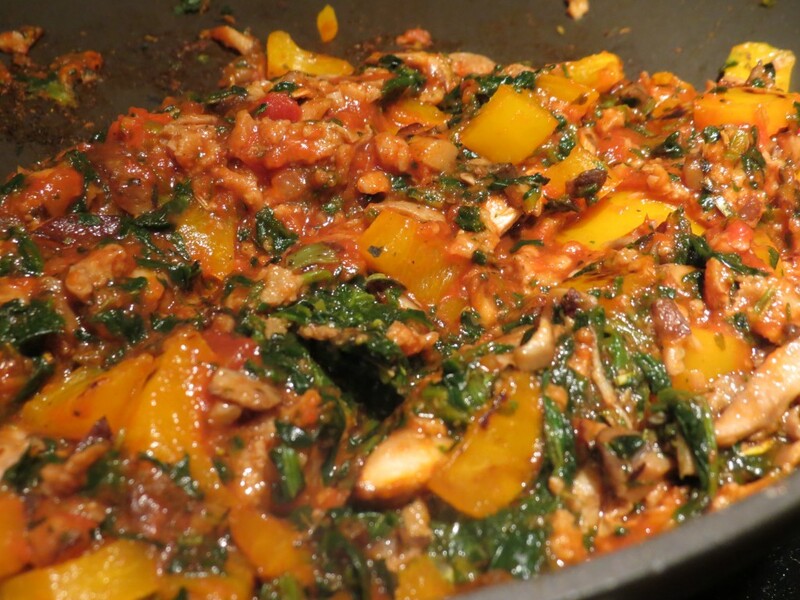 Once the spinach has thawed, thinly slice the veggie sausage and add to the pan along with the tomato sauce. Cook 1-2 minutes until heated through. 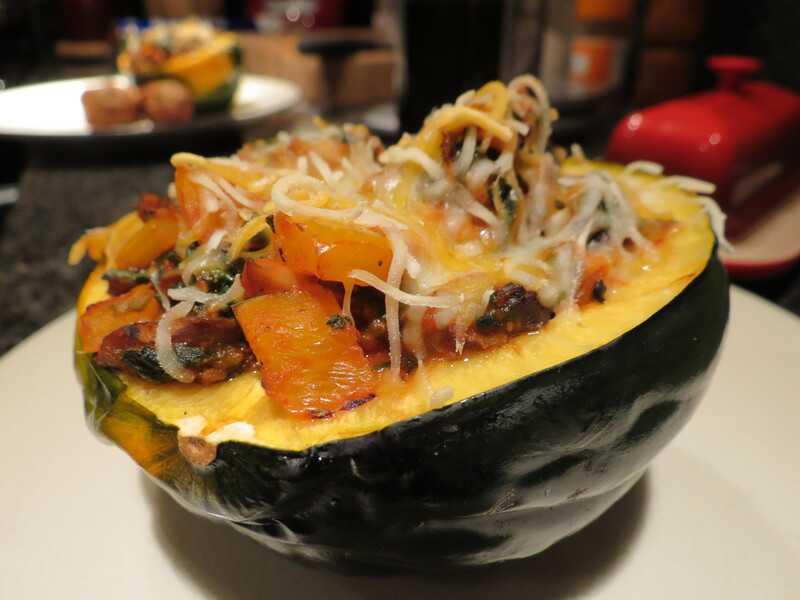 By this point, your squash should be 99% cooked and your oven should be pre-heated ( I told you this was fast). 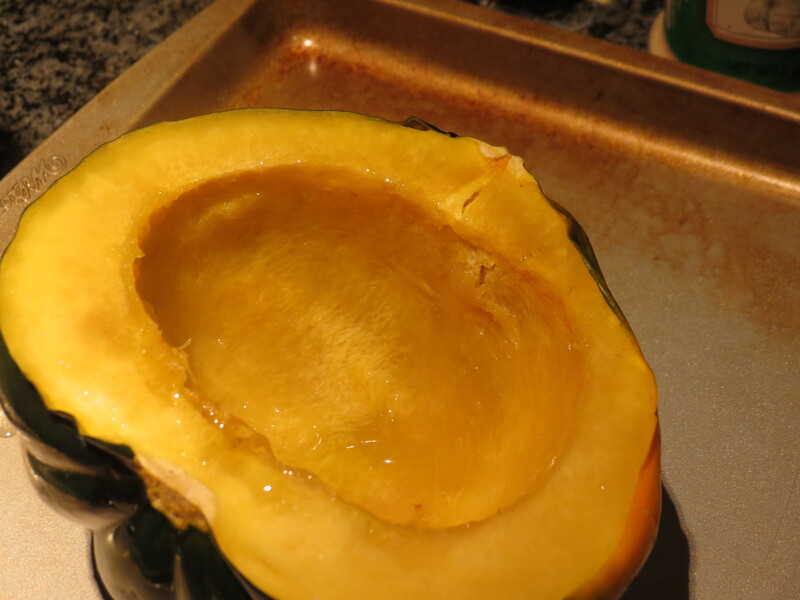 Add the remaining 1/2 Tbsp olive oil to the inside of the squash and divide the filling between the two halves. Your squash halves will be a bit overflowing. Sprinkle shredded cheese over the top and bake 4-5 minutes or until cheese is melted. This dish was a hit. It felt indulgent and creamy thanks to the cheese. Hearty and robust thanks to the mushrooms and veggie sausage and it’s always fun to be able to eat the bowl! 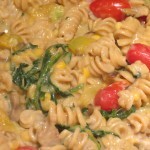 It’s healthy too– one half has only 324 calories and was perfect for a light dinner. You could easily eat both halves for a full dinner, or have a salad or soup on the side! Enjoy!